Adskilder sig fra R. calendulaceum på knopskældene, idet sidstnævnte ikke har børstehår på vækstknopperne, vokser kraftigere og blomstrer tidligere. Vokser til en mellemhøj plante med en flad top. (kan være gul i kronen) R. bakeri blev navngivet til en hybrid (efter sigende) så navnet er illegitimt. Hans Eiberg. R x furbishii I (Mike Creel) found something from Gustav Melquist regarding R. furbishii. He actually recreated what seems to be furbishii through crossing R. bakeri with aborescens. 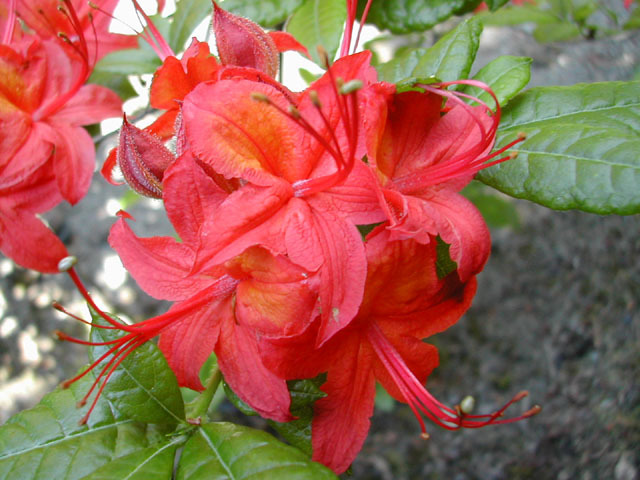 Among the azaleas that I've been interested in largely are two groups. 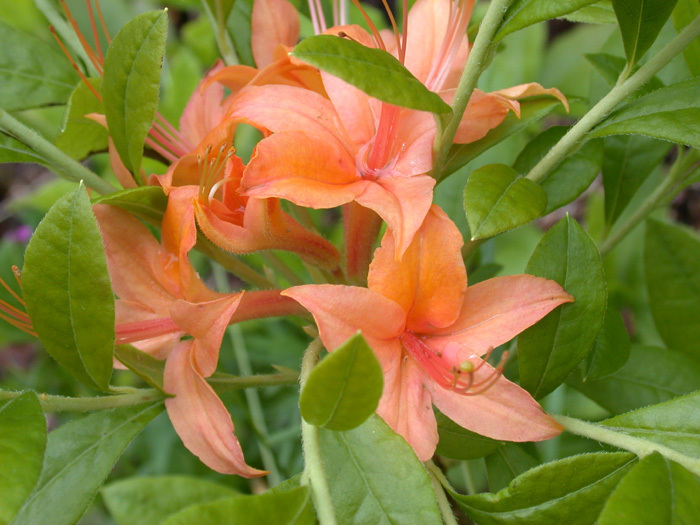 First of all, I was interested in David Leach's statement to the effect that Furbishi [Rhododendron x furbishii] is probably a hybrid between [R.] bakeri [now R. cumberlandense] and probably R. arborescens. I checked Lee's book on azaleas [The Azalea Book. Frederic P. Lee. 2nd ed. Princeton, NJ: Van Nostrand, 1965.] and he suggests that probably the parentage is either bakeri with arborescens or bakeri with a late blooming R. calendulaceum. 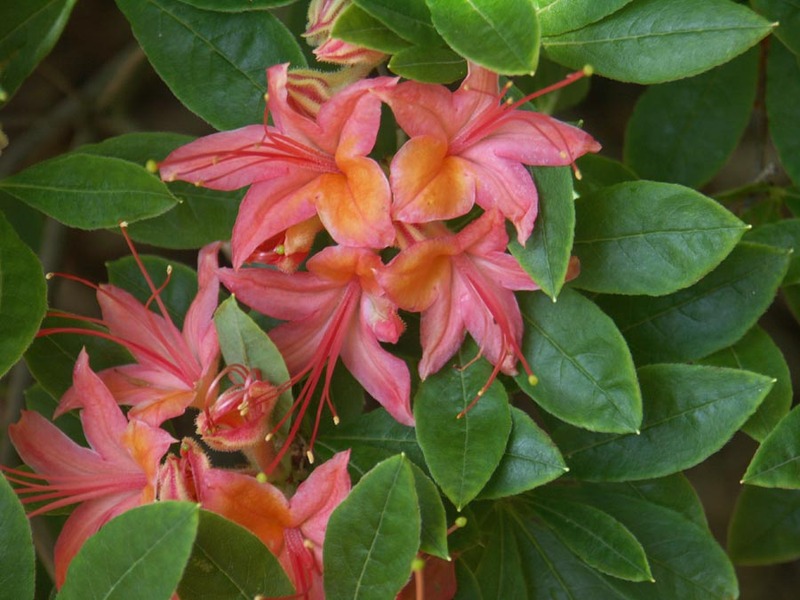 Pages 309-311 in the Kron article contain the write up on Rhododendron cumberlandense E. L Braun, Rhodora 43: 33 (1941) Syn: Azalea cumberlandense (E.L. Braun) Copeland, Am. Midl. Nat. 30: 533-625 (1943). Type: Kentucky, McCreary Co.: Yahoo Ridge, 15 vi 1935, E.L. Braun 971 (holo. Herb. Braun, n.v.; iso A). 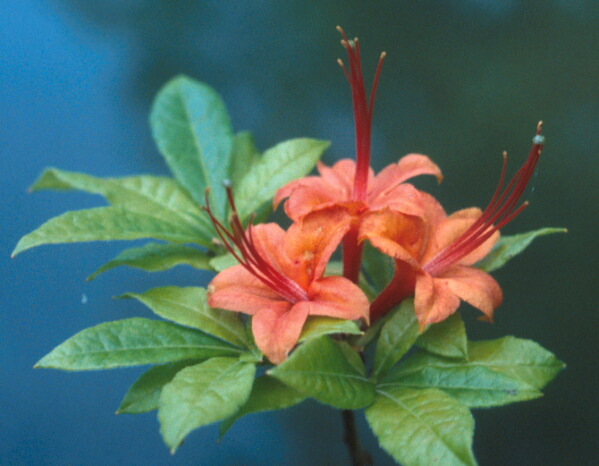 On page 310: "The name R. bakeri (Lemon, 1938) has been used for this diploid flame azalea since Skinner (1955) considered R. bakeri to be the same taxon as R. cumberlandense.. Since R. bakeri, was an earlier name, it was properly used over R. cumberlandense. 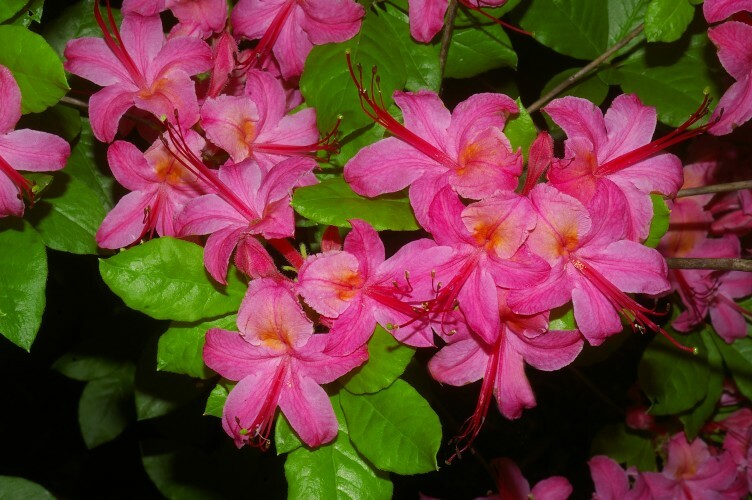 However, the type specimen of Azalea bakeri (=R. bakeri) is not at all similar to the type or R. cumberlandense. 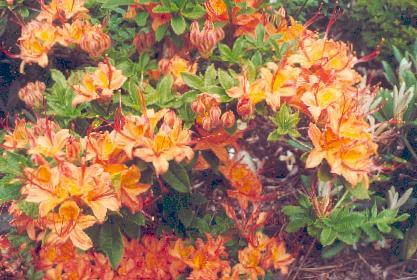 The specimen which is labeled Azalea bakeri by Lemmon, has young expanding leaves, which are densely pubescent on the abaxial surface. In addition, the margins of the floral bud scales are all unicelular-ciliate, and the corolla possesses both glandular and eglandular multicellular hairs. 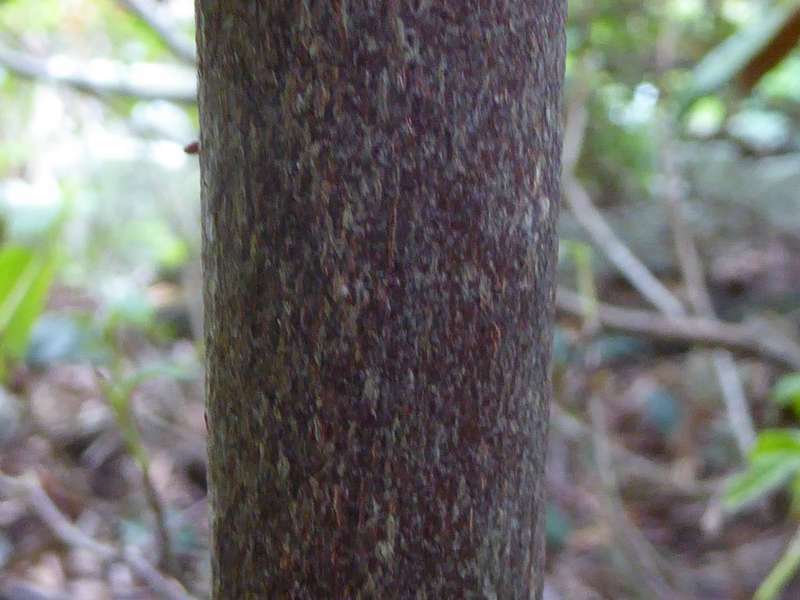 None of the above characters is found in R. cumberlandense, which flowers well after the leaves have expanded and usually has glabrous leaves (never densely pubescent). In addition, the floral bud-scale margins and the outer surface of the corolla are consistently glandular in R. cumberlandense. Therefore Lemmon's specimen is probably a hybrid between R. flammeum and R. canescens (see hybrid names, p. 362). 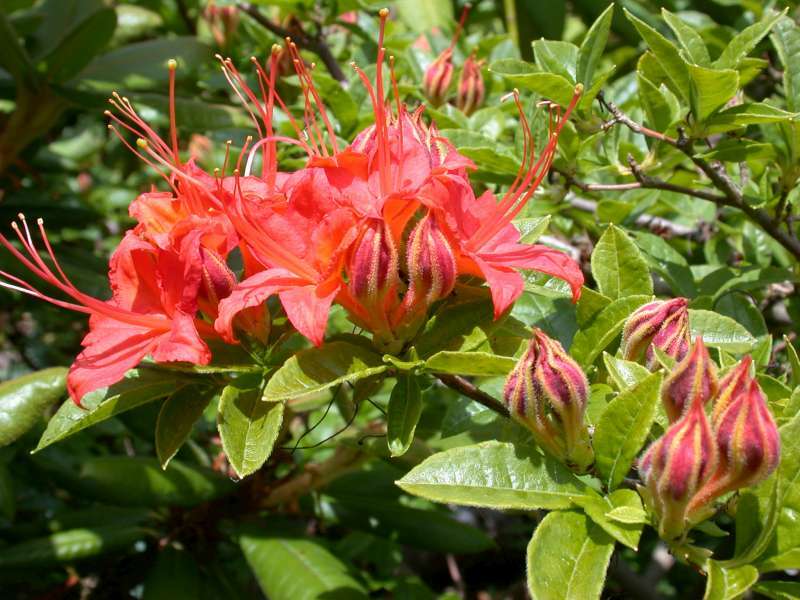 Thus, the correct name for the diploid form of flame azalea is Rhododendron cumberlandense." R. cumberlandense is the accepted name for the species that was formerly know as R. bakeri. R. cumberlandense is diploid, but very similar in many respects to the tetraploid species R. calendulaceum. Since most if us are not able to discern ploidy levels while hiking on the trail, we usually use a hand lens to look at the sepals and pedicels of the blossoms. R. calendulaceum will have glandular sepals and pedicels whereas cumberlandense will be eglandular. Although cumberlandense does tend to bloom later than calendulaceum, there are late blooming forms of calendulaceum that will be in flower at the same time as cumberlandense at the same elevation. As for flower color, cumberlandense tends more toward the orange-red shades in the wild, but we do see orange and gold forms and some approaching yellow. I will say that I haven't seen any pure yellows cumberlandense plants in the wild as nice as image from Robert Day shown on your site but that doesn't mean they don't exist. 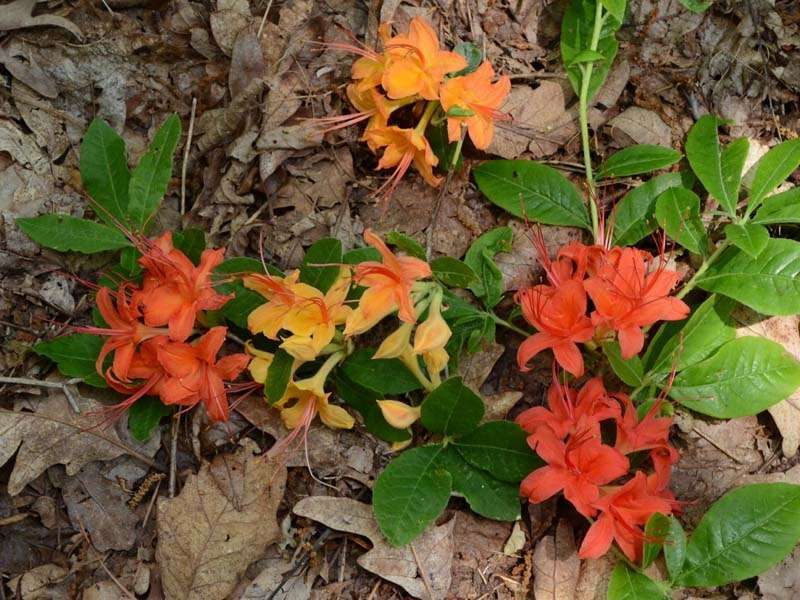 The problem we have with many native azalea populations is that other species are often growing nearby so there is a tendency for the azaleas to hybridize. The hybrid swarm on Gregory Bald is world famous, and there are four species suspected growing in that area. R. cumberlandense does predominate so most of the plants will have orange-red to red flowers, but there is also arborescens, viscosum, and calendulaceum very nearby and they produce flowers in wide range of colors. R. calendulaceum does come in clear yellow, orange, and red, too. It is hard to quantify, but from an artist's eye, the colors found in R. cumberlandense do seem more vibrant to me, a clarity and brilliance that generally surpasses calendulaceum. Both are stunning native azaleas, though. R. calendulaceum tends to have larger blossoms, too, but both species put on a great show. An isolated population of cumberlandense occours in the wild in the mountains of Eastern Tennessee near the Cherohala Skyway not far from Tellico Plains.